We present the fourth part of our River Country series. Rumors continue, as they have for years, about what will happen with the River County land. One thing is for certain, River Country will never open to the public again... At least not as the River Country we remember. When you think about it, it's not all that shocking that Disney closed something only to let it rot. They've been doing that for years. I for one am glad River Country stuck around. We can now enjoy creepy photos of the abandoned place. Few Disney attractions close and are demolished immediately after closing, for whatever reason, unless the replacement attraction is ready to be built. Think of: 20,000 Leagues Under the Sea, Submarine Voyage, PeopleMover, the Skyway towers, Image Works, Food Rocks, Mission to Mars (Disneyland), America Sings, etc. All were abandoned for years after they closed, before they were eventually removed completely or redesigned as something else. Below we get a view of the Contemporary and even Bay Lake Tower. In Part 1 we see similar photos not long before Bay Lake Tower was constructed. Additionally you can see Space Mountain. A banner encouraging "recycling". Ironic. An old yellow float tube. Once again we encourage you to not tour this closed area of Walt Disney World without permission. Also enjoy [Part 1], [Part 2], and [Part 3]. Photos from "Tri-Circle D" at The DIS Discussion Forums. Images of Resort Guest tickets from "CAJUNWDWFAN". A big thanks to all three. This excellent map is from 1993. I love the woodcut style. I always love designs with choice, limited color palettes. Even the Goofy artwork matches the rest of the design. Thank you, Mr. Gibson for the scans! I suppose the canoes are from Fort Wilderness recreation. The basketball hoop, for cast members. Reminds me a little of the run-down basketball rim bolted to a wooden staircase in top portion of the Matterhorn. That too has been quite abandoned. 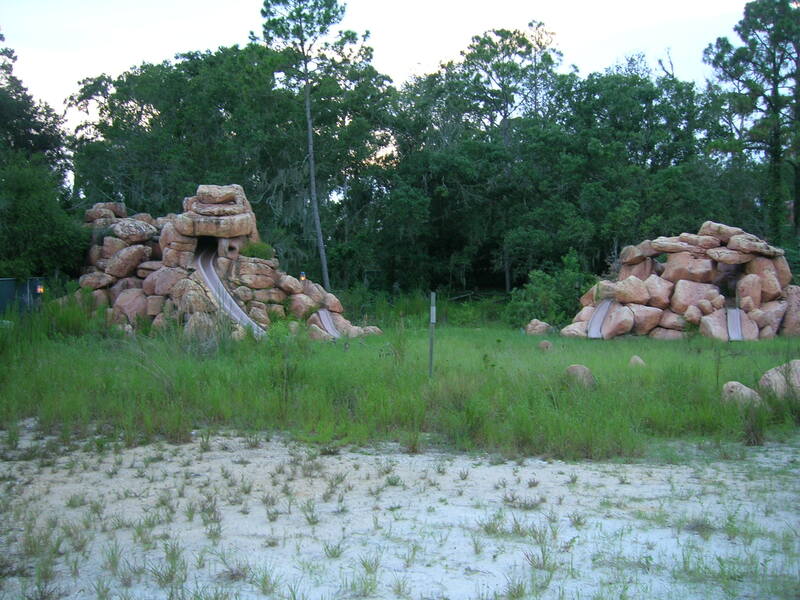 The cage-like wooden boxes (seen in the last two photos) made me wonder if they came from Discovery Island. Who knows. Also enjoy [Part 1], [Part 2], and [Part 4]. Thanks for a great response to Part 1. Here are a few more photos of abandoned River Country. 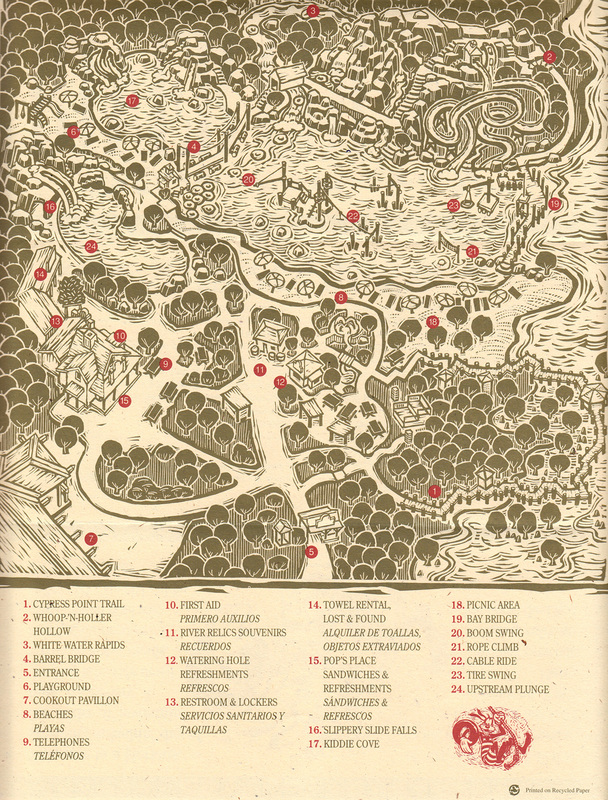 River Country sure was “the kersplashingest, kid-laughingest, rope-swingingest spot imaginable for the wet set” as shown below in this 1976 WORLD Magazine article, Today the World has a New Country- sent to us by my pal, Hoot. If you have any great River Country photos, send them our way! Also enjoy [Part 1], [Part 3], and [Part 4].